I will admit, I'm pretty tired of the typical pizza that is found at nearly every pizza place out there. How many times have you seen a Margarita pizza on the menu, with the words "our specialty" or something to that effect written by it? Making my own pizza gives me the option to be creative and fun. And it's also a great chance for Dave and I to cook together. We can either make our own little pizza's or do half and half; it's just about being together. I have previously posted a quite nice thin crust pizza dough if you want to tackle a homemade crust. It's easier than you think and you should try it sometime. No matter which dough you go with, add a little corn meal to the bottom of the pan, this will give that pizza parlor feel and help keep the crust crisp. If you have a pizza stone, be sure to heat that in the oven first. Just have fun with it, and vary the spices to your liking. Add more cheese or more spinach. It's just pizza - as we always say, even bad pizza is still good! Next time your craving pizza, stay home, open a bottle of wine, make a night out of it and just be fat and happy! Below are two versions of pizzas, both very good and each very different. 2 cups of tiny shrimp, peeled and deveined. Warm the olive oil in a large frypan. Add the garlic and shrimp. This will only take a minute or two on each side, shrimp really cooks quite quickly. 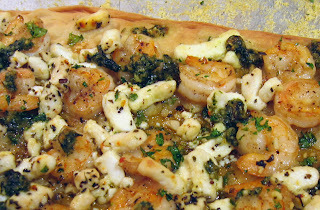 Spread the parsley pesto onto the prepared dough, add the cooked garlic shrimp and the cheese. Bake until dough is crispy on the edges. Let this all simmer together until thickened. Cook 5 strips of bacon and one-quarter of a white onion, sliced until bacon is desired crispiness, set aside. Now take 2 big handfuls of spinach (about 3 cups) and give them a rough chop. Sautee this in your bacon pan, don't wipe out the grease as this will give great flavor to the spinach. Top your rolled out pizza dough with the red wine sauce, the bacon the spinach and now add grated cheese. I used a simple pre-shredded Italian mix. Bake until browned and bubbly.